Explore the highest capital city in the world, Quito. Sleep in first class accommodations: historical haciendas, scenic mountain lodges, and high mountain huts. Set foot on the Equator. Relax in the natural hot springs of Termas Pappallacta. Our expedition begins in the city of Quito in the high Andes, surrounded by beautiful valleys and spectacular mountains. As soon as you step off the plane, you will notice the altitude as Quito sits at 9,350ft/2,850m. This city has been described as “where the old meets new”. Its historical, cultural, and contemporary heritage makes it one of the wonders of the world. In 1979, UNESCO declared Quito’s historic center a World Heritage Site. In 2004, the city was named the Cultural Capital of the Americas. Ecuador is the smallest of the Andean countries, yet its location at the equator means that it spans two hemispheres. With its Andean peaks, Amazonia rain forests, and the Galapagos Islands, Ecuador has incredible diversity for a country the size of Italy. Guagua Pichinchaa, 15,696ft/4,784m – Our first acclimatization hike is above the city of Quito. The summit is composed of several spire shaped rocks. This is not a technical climb but due to its altitude and being our first hike it will be challenging. Fuya Fuya, 13,986ft/4,263m – excellent acclimatization climb, near the summit we will be roped for a short rock climbing section. Cotopaxi, 19,350ft/5,900m - The symmetry of this beautiful glaciated volcanic cone is world famous. We begin our climb ascending from the Jose Ribas hut to the top of the trian­gular rock slope and then onto the glacier, moving around crevasses to the summit. 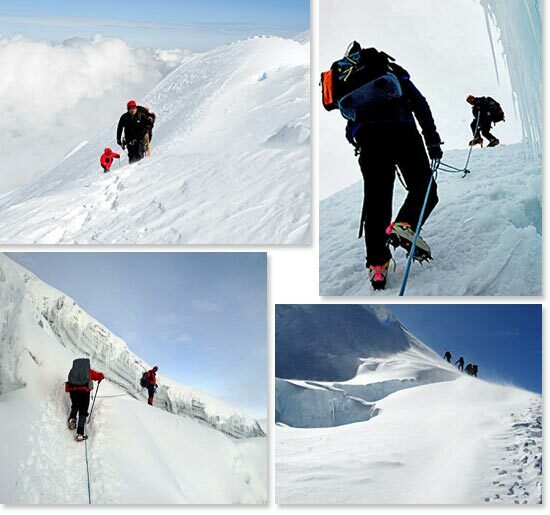 This climb is a perfect introduction to climbing at high altitude. 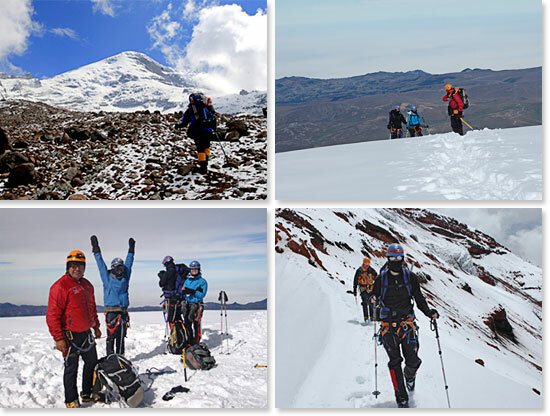 Chimborazo, 20,703ft/6,310m – Chimborazo’s summit is the furthest distance from the earth’s core, due to its location on the Equatorial bulge. We will start our climb from the Whymper hut at 16,405ft /5,000m; moving NW up scree to access the glacier which can be difficult depending on the snow conditions. Once reaching the glacier ridge, it is a long ascent to the summit, 14 to 16 hours round trip from the hut. 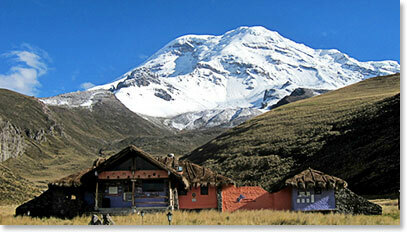 View our previous Ecuador dispatches. The main challenge on this expedition will be the altitude. You will need to carefully monitor your body’s ability to acclimatize. This will require patience and good judgment. Your guides will help you make good decisions. Prior mountaineering experience is recommended but not necessary. We will spend necessary time reviewing and learning skills. We will take the opportunity to review rope techniques inside the Cayambe hut. We also will climb above the hut to practice the use of crampons.